When 1997, in response to the Peter the Great year, the exhibition Windows on the Netherlands; impressions by artists from Saint Petersburg was organized and several Russian artists showed their work in the Netherlands, it was for the first time the Dutch audience was introduced to the works of sculptor Alexander Molev. With his statue Skater Molev won the first prize for sculpture that was connected with this exhibition. Gallery Lilja Zakirova from Heusden recognized such a talent in him that she took him into her stock to give him the attention he deserved. Alexander Molev (1952) is born at the countryside in central Russia (in Jaroslav) and left for Saint Petersburg at the age of 18 where he studied from 1970 to 1976 at the School for Drama in this city where he specialized himself in staging. 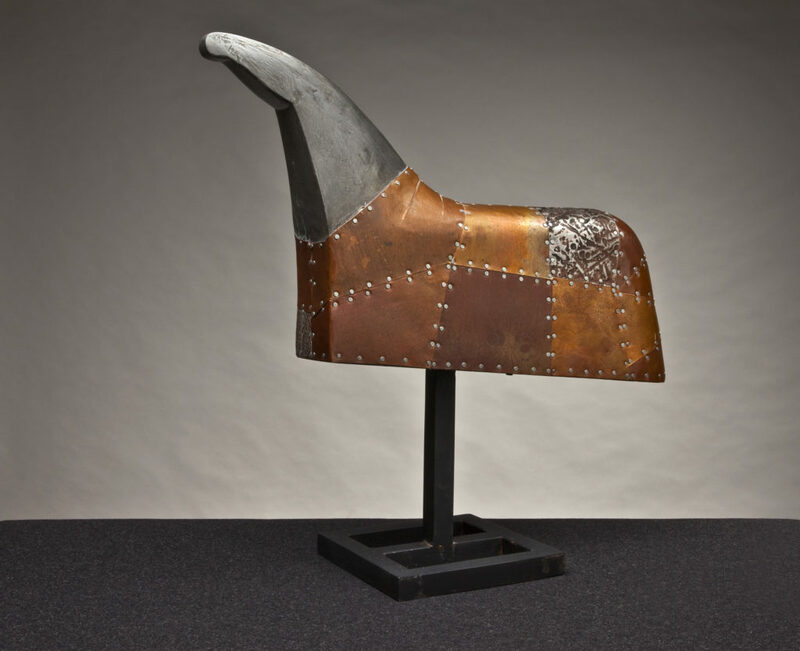 During his education his artistic aspirations grew on the visual aspects and in 1978 he decided to develop himself further as a free visual artist. He was accepted at the famous Repin Art Academy in Saint Petersburg where he finished his education in sculpture in 1984. After that he followed intensive post academic atelier lessons by professor Anikuschin, also connected to the Repin Academy. His talents where early recognized during his academic period and from 1982 he was awarded with several exhibitions in and outside Russia. 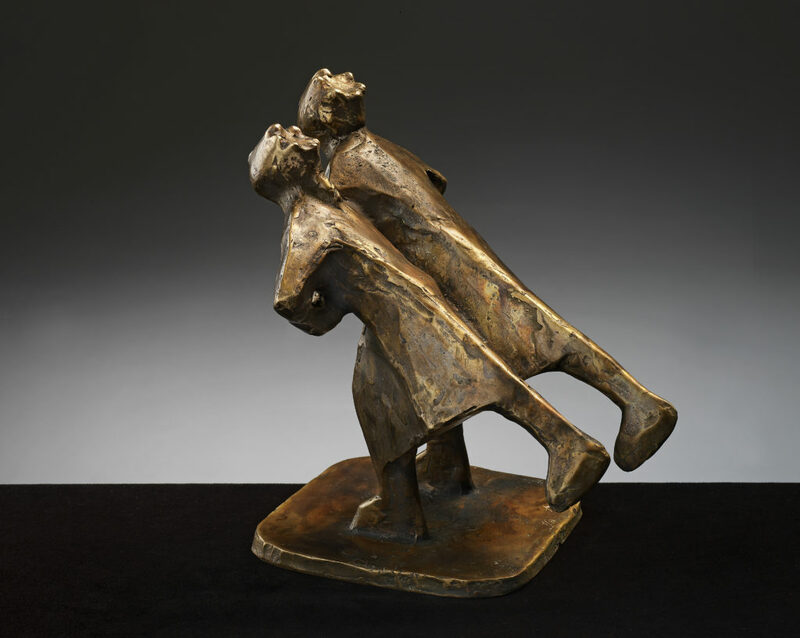 Several of his works have found their way into public Russian art collections such as the Russian Museum of Saint Petersburg and also the ministery of culture has acquired several his statues. The sculptor sculptor remained to live and work in Saint Petersburg throughout his life. The prominent presence of the classical sculpting tradition in this Russian city has played a huge role in the artistic process of the sculptor. For a inhabitant of this city and especially for a sculptor it is an inevitable confrontation with many copies of the statues from the classical era that reside along the long lanes with the linden trees in the central Summer garden. And also the presence of the famous works by artist such as Houdon and Rodin in the nearby Hermitage Museum will not leave a sculptor untouched. Alexander Molev was challenged by them. Challenged in the sense that he battles the almost compelling presence of the academic sculptural notion that many of these works imply. In great isolation, like a recluse, with honorable competition he combats them and searches his own plastic language. Alexander Molev choses the human form as his subject. In this he does not differ from his classical predecessors. Together with his affinity for the theatrical, also explainable from his previous schooling, we see shapes that show an expressive posture, a mental state or physical activity. An astrologist, who stares concentrated through his telescope, a fanatic marching soldier with lifted arm and leg, a skater sliding wit ease, hands on the back, a walking figure whose upper body is hidden underneath the canoe he’s carrying, a blindfolded person who with stretched out arms and careful steps seems to be finding his way. Figures in a pose of concentrated resignation. The stylization of these figures is striking. Their plasticity is to be called more geometric than organic. 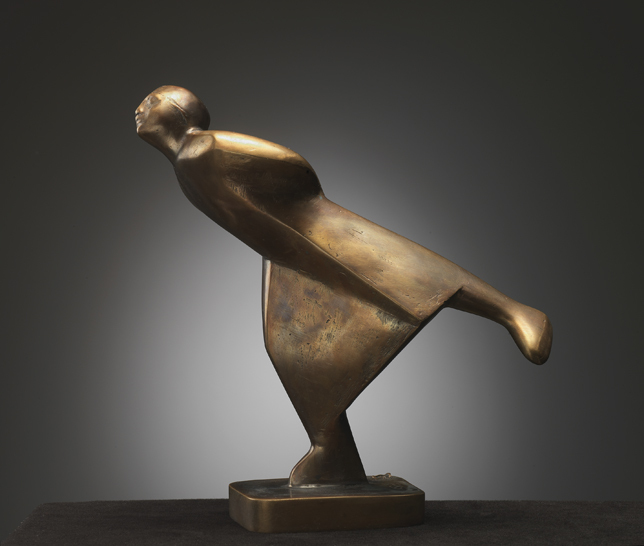 In many of Molev’s statues the straight diagonal line is used as the main line dominant in the often crosswise compositions these figures form. This almost geometrical style is enhanced by the outer coating of the statues by triangular copper plates of different shades of copper that are secured by small black nails on the primary wooden statue in such a way that the triangular plates get an extra accentuation. Often Molev uses tin cast shapes in his statues. Such as hands and heads. These contrasts in color on one side with the copper plates and on the other side they maintain the volume of the metal seeming statues on the other side. It is striking, despite the use of these materials, that the statues do not seem heavy and voluminous. The triangular fragmentation of the surfaces and the subtle changes in color by the different shades of copper, the silvery white tin and the often shiny nails present the statues with a subtle playfulness and lightness. Also the literal lightness of the statues – the volume is decided by the wooden frame underneath ‘the skin’- enhances this. 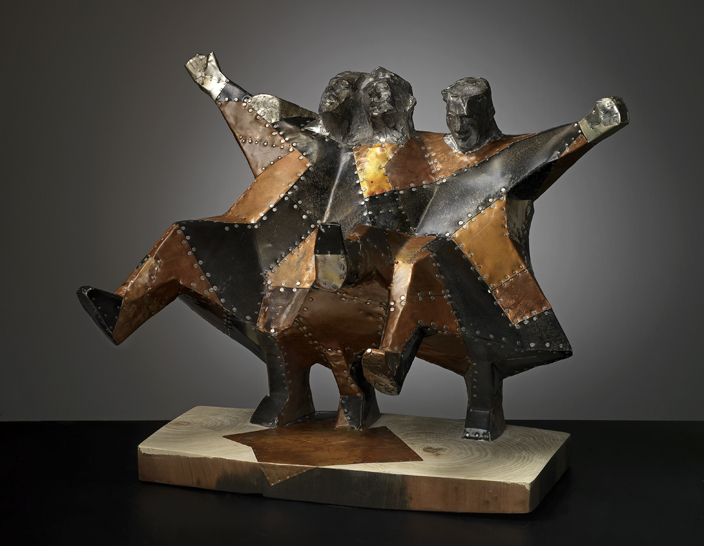 The robust, angular shapes of the statues are lifted from the anecdotal, because beside the recognition of the human figure in concentrated resignation in their actions, the viewer can be fascinated by the esthetic and exciting play of shapes, lines, materials which make up the aspect of the statues. The image has become an onject, sometimes even as an abstract sign. And with this Molev places himself in the new sculpting tradition, which has started at the end of the 19th century. The figure as an esthetic decorative form, that enhances the substantive impact of the work and at the same time lifts it from its literary, descriptive character from a figurative work, we’ve seen since Rodin’s statue of Balzac more and explicitly in the 20th century western art history. 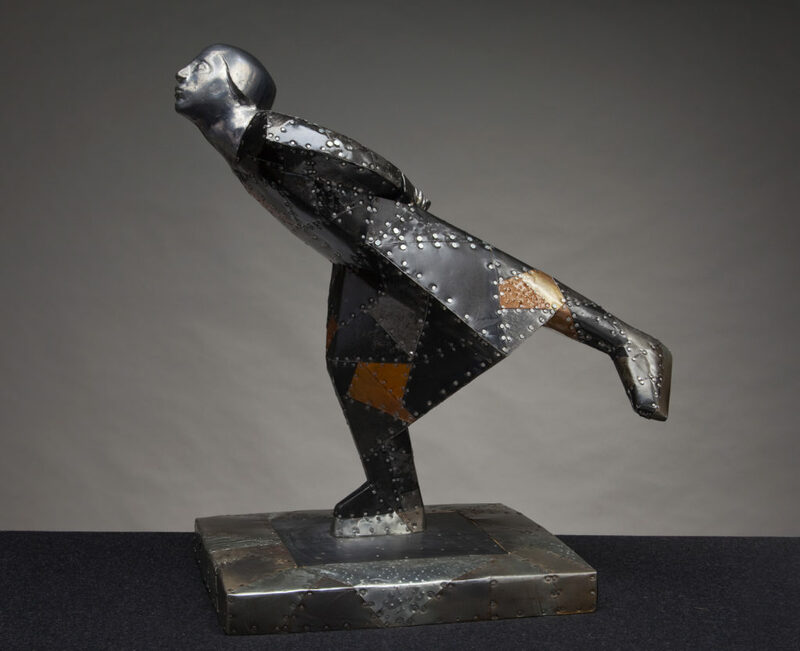 This way the tension in the postures of the figures by Molev remind us of the works by the great Italian sculptor Marino Marini, and his expressiveness of German sculptor/expressionist Ernst Barlach. The universal desire for balance and harmony within the composition remain however strong in the works by Alexander Molev. Therein lies his strength and with that he can call himself a true classic sculptor.